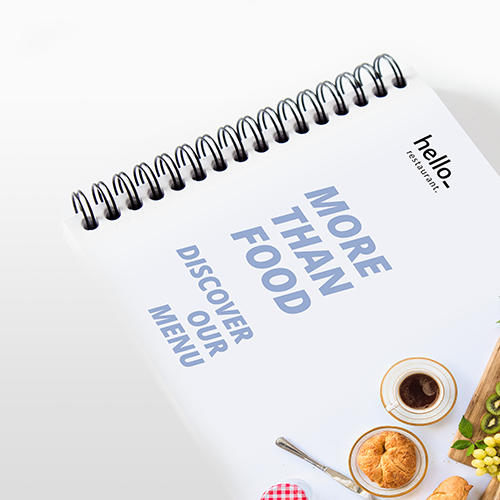 Go above and beyond with Helloprint's professional Spiral-bound Menus! 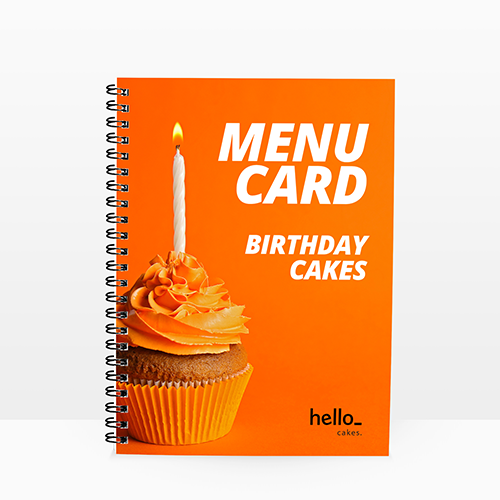 Display all your favorite deals and meals with your favorite designs too. 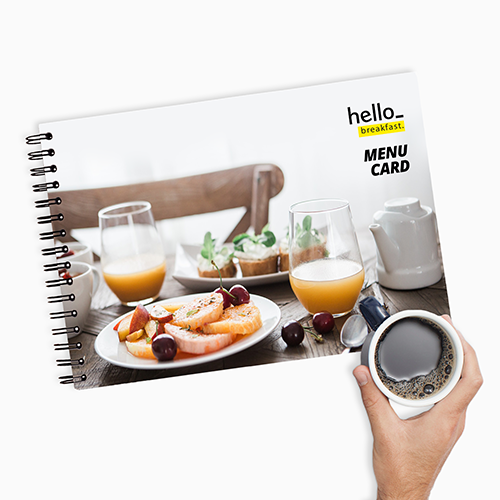 These menus come with a sturdy silver coil to keep everything in its place, adding a sleek and professional look to the final product. 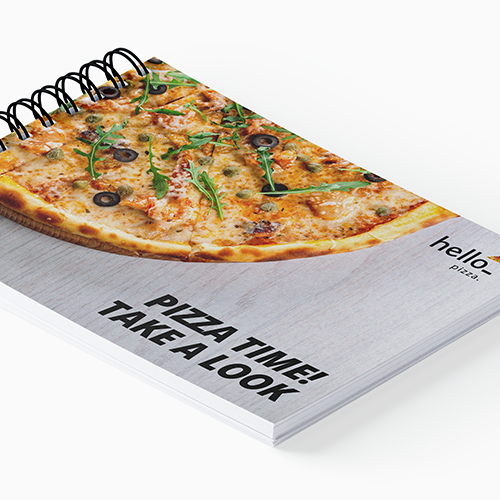 These menus will go the distance, with a transparent cover to help protect the pages and to keep your customers feeling confident with their choice! "To make sure that there are no pages falling out of the brochure, we make use of a format that is twice as large as the final format of the brochure. When you choose for a A4 size brochure with 8 pages, then we will print two A3 sheets (two times as big as A4) and fold it in half. When you want to number the pages you will find out that you can number from 1 to 8. Every A3 sheet will have four pages. Don't have enough content to fill four pages? Then, there are some solutions of course: You can find a sponsor who would like to have his advertisments in you brochure or make use of an extra introduction page. You can leave 1 or more pages white, or be creative and design an extra page in the style of your brochure." The maximum amount of pages available is 200. However, most of our orders have between 10 and 64 pages. That is the reason why we only show these amounts on the website. If you are interested in more than 64 pages, please contact customer support. A stapled brochure is a small book consisting of 8 or more pages and is finished with metal staples. A brochure consists of the contents (pages) and the cover, which don't have to be the same. Our brochures are available in various types of paper, combinations and numbers of pages! For the delivery of your spiral-bound menus we use multiple carriers. Because of the highest reliability, in most cases we use UPS or DPD. 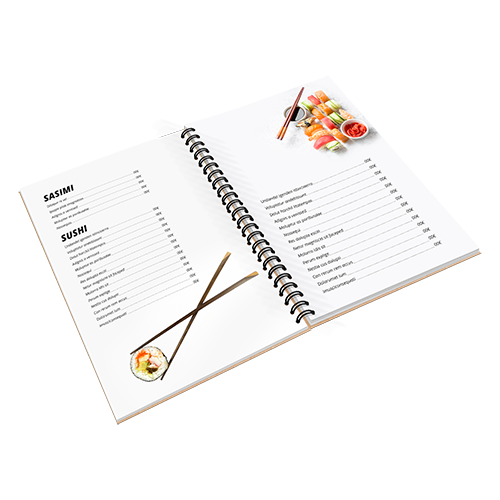 The spiral-bound menus that is chosen in most cases can be selected via our website.